Thanks to the growing popularity of ballroom dancing on television (Dancing with the Stars, anyone? ), the Tango is one of the most popular couples’ dances around. Maybe that’s why it’s the perfect subject of dancing dentist Dr. Lewis Gross’ novel Montauk Tango. The first couples’ dance—a dance in which a man and woman face each other, with the man holding the woman’s right hand in his left hand and his right arm around her—was the Viennese Waltz. Prior to this European craze, which took place in the 1830s, couples’ dancing was formal and highly choreographed, with no more physical contact than holding hands. During the 1840s, the Polka became the second popular couples’ dance in history. Then, the Tango came along and radically changed the way couples interacted on the dance floor. Introducing the concept of improvisation and playing into human sexuality, the Tango had an intense influence on couples’ dancing in the twentieth century. It is thought that the Tango began as an evolution of dances performed by commoners in Argentina. Because a majority of these people and cultures were lost during times of war and conflict, the exact origin of the Tango cannot be traced. There are, however, a few facts we can rely on. In 1857, the first piece of music classified as tango was published in Argentina. This piece, called “Toma mate, ché,” falls into the Tango Andaluz (Andalucian Tango) style of music and is from the area of Spain that is home of Flamenco, which was a popular kind of music in Brazil in the mid-nineteenth century. 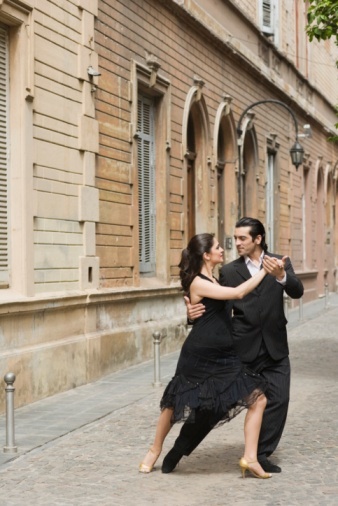 Because the origin of Tango cannot accurately be traced, there are many theories about its rise to popularity, including rumors of African influence. However, it is the theory that Tango developed as a favorite pastime of poor, uneducated, common people that holds the most truth with enthusiasts. To find our more about the art and seduction of Tango dancing, check out Dr. Lewis Gross’ novel Montauk Tango. This entry was posted in Tango, The Tango and tagged book about tango, dancing dentist, dentist lewis gross, Dr. Lewis Gross, Montauk, Montauk best seller, Montauk Tango, montauk tango book, montauk tango novel, ny tango, origins of tango, Tango, tango book. Bookmark the permalink.